Meaningful use expert Jim Tate has written that the Medicaid EHR incentive program reminds him of "zero entry" swimming pools: very easy to get into, with almost no barriers. Given its less stringent requirements compared to the Medicare EHR incentive program, Tate writes, he's surprised that more eligible professionals are "not jumping into this incentive program with both feet." Healthcare IT News asked Tate to expound on his blog post “Medicaid incentives the way to go,” which noted that the most attractive component of the Medicaid EHR program vs. the Medicare program was that to apply and receive the first year incentive eligible providers (EPs) don’t have to be using an EHR. That's because EHR adoption is defined as having "acquired, purchased or secured access to certified EHR technology." In other words, says Tate, a signed contract means EPs are eligible to apply and attest to their state Medicaid agency. Q: Since you say the Medicaid incentive program is “the way to go,” why is it "easier" than the Medicare program and are there any other differences that you could highlight that providers may not be clear on? A: The Medicaid incentive program is easier in that in an eligible provider's initial year they don't have to achieve meaningful use, as is required in the Medicare incentive program. In addition, there are no potential penalties and the incentives are not front-end loaded. To receive the maximum Medicare incentive an EP must begin in 2011 or 2012. In the Medicaid program they can wait as long as 2016 to enter the incentive program and still receive maximum incentives. Q: What could be some of the reasons that Medicaid EP's may not be “jumping into this incentive program with both feet?” Could it be related to not enough patient volume to meet the quota, price of EHRs, or could it simply be that providers are unaware? A: I think many Medicaid EPs who meet the patient volume threshold simply do not know how low the bar is to receive first-year incentives. The price of an EHR isn't an issue as the first year Medicaid incentives are $21,500, more than enough to offset the cost of the technology. Q: What was some of the feedback you received on this blog? A: Many were surprised that under the Medicaid incentive program they could apply for the initial $21,500 incentive solely on the basis of a signed contract. Q: What is the single most important advice you could give to providers about the Medicaid incentive program? A: Go to CMS.gov and use the widget titled "Medicare and Medicaid EHR Incentive Programs" to see if you qualify as an eligible Medicaid EP based on your patient volume. 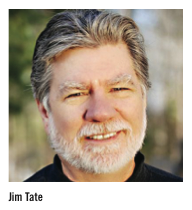 Jim Tate is author of The Incentive Roadmap: The Meaningful Use of Certified Technology: Stage 1. He blogs at HITECHAnswers.